Hurler Canyon is located just outside of Arizona's Superstition Mountain Wilderness boundary in the Tonto National Forest. Five of us were able to complete the route on November 10, 2013. Although we had an abundance of gear, the trip was successfully completed utilizing (1) 330' and (1) 180' ropes, and (1) 230' pull-cord. While there is a road leading to the hiking point from the parking area, this is a restricted road, and is not accessible to the public. Please refrain from driving your vehicle past the parking area regardless of how exhausted or lazy you feel. As of today foot traffic is tolerated, however, abuse of this privilege will result in future access issues if not respected. Once we hiked down the road, up the drainage, and around the cliff band, we found ourselves at the ideal drop in point to access the canyon. 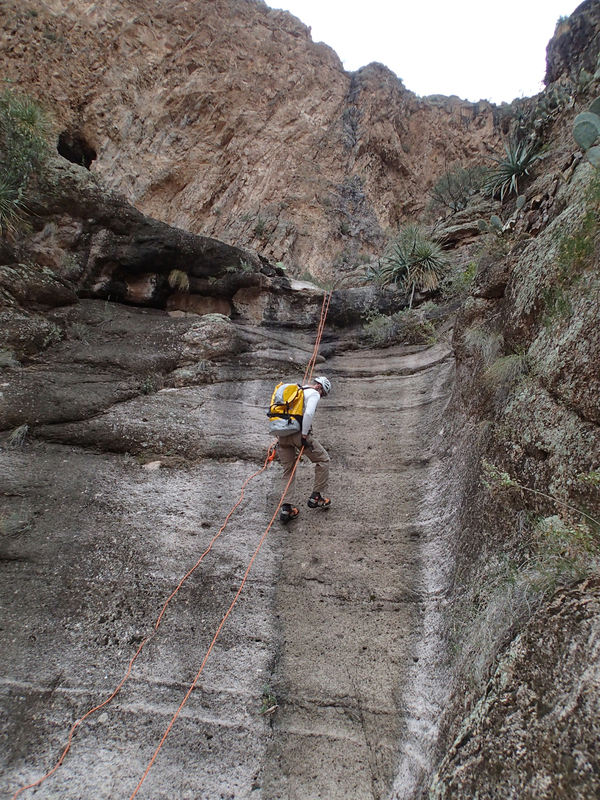 We sized up the first rappel to be a 260' drop to a sandy (and rocky) bottom. 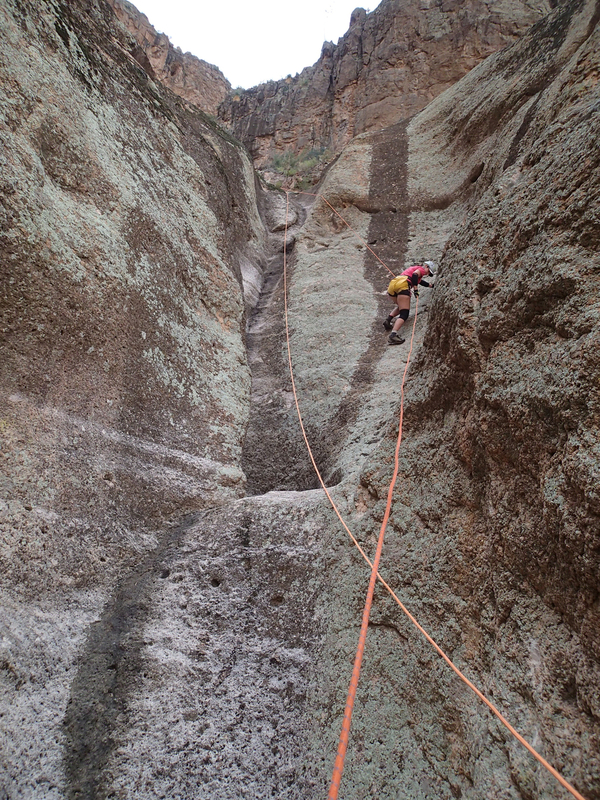 The entry rappel is easily found by following the drainage down to the point where it drops off into the canyon below. This area was large enough for the five of us to gear up and stage our rappel without feeling cramped. Our webbing on this large rappel was set up to extend to the cliffs edge, but if alternate anchors or shorter webbing are used, it could easily add 30' to the length of the rope required to reach the ground. 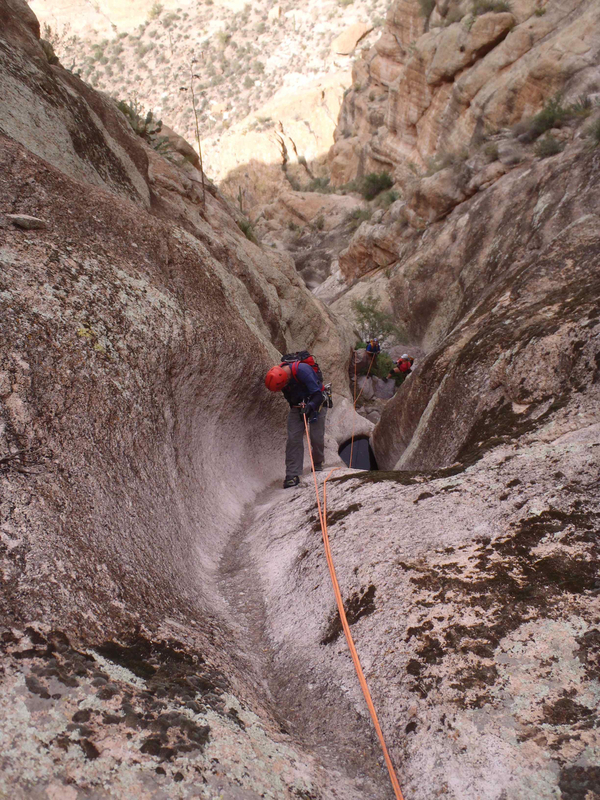 Due to patches of rough rock and brush at the top of the first rappel, a test pull may prove beneficial. Soon after the entry drop, we found ourselves in what could be considered the 'Narrows of Hurler Canyon'. This narrow section contained several nice rappels, a few down climbs, and a small, but potentially deep pothole that was easily avoided on canyon left. Eventually you are spit out back near the route you had hiked in on earlier and working your way canyon right seemed to keep us out of the worst of the cat claw. Groups attempting this or any other canyon for that matter should be prepared with enough knowledge and gear to repair or address any anchors as needed. Top to bottom we set up 8 anchors, but once on rope, one of these drops was a fairly straightforward down climb.